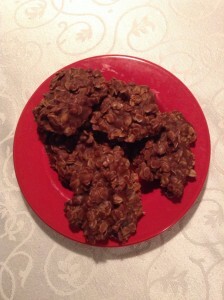 Share the post "No Bake Cookies"
Mix ingredients in sauce pan and boil one minute. NO LONGER. Take off heat and add half cup creamy peanut butter. Stir until dissolved. Add 3 cups rolled oats and one teaspoon vanilla. Stir and drop onto greased cookie sheet. Refrigerate until firm. This is my favorite chocolate fix and so easy to make! It’s important to use creamy not crunchy pb, not the same.